In addition to being Friday the 13th, today is also Pigeon Appreciation Day! Pigeons might be much maligned and rather disliked birds to many, but they really are rather amazing once you look past the "rats with wings"-image. Mental Floss has a really good article on the history of pigeons, for those of you who'd like to know more about these fabulous fowls. To mark this day of celebrating my most favourite birds, I finally finished Livia (she's named after the Rock Dove, Columba livia), my pigeon inspired rag-cat, who I mentioned in my Pigeon Appreciation Day post last year. 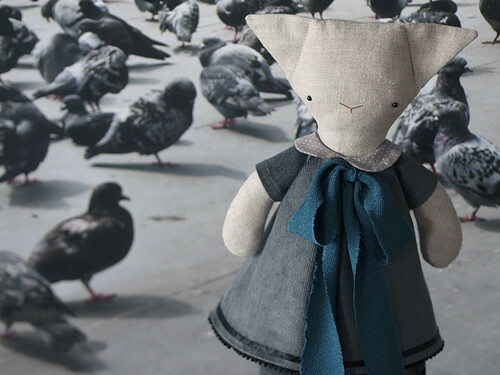 Livia the rag-cat is a huge big fan of pigeons! She goes to the park every day she can to feed her pigeon friends and she keeps her own small flock of messenger pigeons who take care of all of her correspondences. 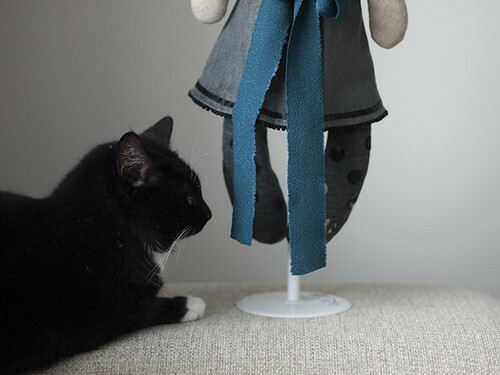 Livia is made out of linen and she has a shiny pigeon grey corduroy dress with an oversized silk bow on it. The polka-dots on her tights are flocked! Livia is waiting for someone to come appreciate pigeons with her in the Rag Pet Shop.